a really good book that you can’t put down. a style of book: a plot-driven thriller that keeps you in suspense so that at every moment, you want to see what happens next. a physical format. It’s a book with large fonts, large margins, and lots of space between lines. This means few words per page, which means you turn the pages more often. The physicality of reading the book (which requires constant motion) puts you into a state of excitement and makes you think, “Wow, I am really engaging with this book”. Page turners also tend to have thick pages, so that as the pages gather under your left thumb, you can actually feel the palpable thickness that you’ve already gone through. 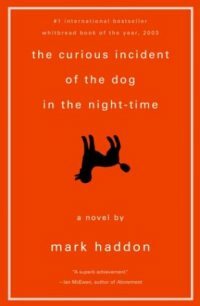 I recently read Mark Haddon’s The Curious Incident Of The Dog In The Night-Time. This book meets all three of the above definitions. It’s a great book. I kind of always knew it was going to be great. I read the first twenty pages of it a long time ago when I found it in my house (I think my dad bought it), but somehow I wandered off and never finished. After a friend recommended it, I read it and…it was good. It’s an awesome, humorous story told from an autistic kid’s point of view. If you’re an SF fan then maybe it’ll help to say that it’s a lot like Elizabeth Moon’s Speed Of Dark, but a lot more comic. But when I opened this edition of the book (pictured, hopefully, to the right), I immediately noticed that it’s in kind of an odd format for the literary darling that it is. The spacing between lines is, for a printed book, absolutely huge. It’s like 1.5 spacing, at least. And the margins are also huge. The font size is also several points larger than is typical for a trade paperback and it’s also some sans-serif font, like Calibri or Arial or something. The pages are also very thick. The book only has 260 pages, but it’s over an inch thick. I own 500 page books which are significantly slimmer. What an interesting decision. The edition I am familiar with, both from my dad’s copy and from bookstore shelves, is a different one (the cover of my dad’s edition is pictured to the left). This edition clocks in at 220 or so pages, and it’s also significantly thinner (half an inch or less, as I recall). On the shelf, it looks novella-sized, like the Great Gatsby or The Heart Of Darkness or something. A quick glance at the inside of the book using Amazon shows that it has a smaller font and line spacing (and its using a serif font too, but I am not sure of the significance of that). It’s strange. This same book was produced both in a semi page-turner format and in a slim, elegant literary format. A quick glance through Google Book Search shows that there’s also a 320 page version floating around, whose font size and line spacing look even more pageturnerlike. From Mark Haddon’s Wikipedia page, it looks like the book was marketed for both kids and adults. Maybe the reason that I only encountered the version my dad owned, before, was that I usually don’t look at books marketed for kids, but since the library doesn’t discriminate, it gave me the kids’ copy. It’s an interesting challenge to my preconception to see a book like this. It’s similar to how, 30 or 40 years ago, a lot of literary classics were marketed in mass-market paperbacks (sometimes because they were not yet classics). For instance, I originally read Hundred Years Of Solitude in mass-market paperback form (the same format as most paperback SF novels and thrillers, whereas most literary novels are published in trade paperbacks which are a little taller and wider and have slightly nicer cover stock and glue and such). If we think of frequent page turns as making a page turner, then the biggest page turners of all are ebooks. Most ebook reader screens will display (at preferred reading fonts) far fewer words than a typical paperback page. I wonder if this makes peoples’ subjective experience of ebooks systematically different from their experience of the same book when it is in paperback. Also, there are no class differences amongst ebooks. All books look the same. I wonder if this will eventually start to change. I think, in a way, that people might enjoy being able to tell, at a glance, that a book is a literary-type book in its nice trade paper format or that it’s a sci-fi potboiler in a mass-market format with a spaceship embossed on the cover. Maybe those same shorthands will start to develop in ebooks. Do you folks enjoy reading poetry? Wow, I’ve only encountered the version with the red cover; I didn’t know the blue-cover version existed. As I recall even the version I read had larger-than-usual print and far fewer words per page. In the case of this book, I also wonder whether the format is meant to reflect the narration in some capacity. I suspect that this market signaling will persist, at least for a while. When you order a book on amazon– hard copy or electronic– you still see a cover. Even as you increasingly make book selections based on direct recommendations from people in your social network and very targeted ads based on your browsing history, these online messages will still contain images and text that suggest the book is perfect for YOU. And even when you download a book and read it on an e-reader, you still want it to look and feel like the kind of book that you want to read. True, there are definitely still covers, even if they’re only those little 200×300 pixel screens in the upper left of the Amazon page for the book. And, in a way, the market signaling for ebooks is even more versatile and multi-faceted than that for paperback books, because it largely occurs through Amazon.com’s recommendation engine, the one that shows you other books which are like the one you’re looking at. But the democratic part of me is kind of intrigued by the notion of breaking down the visual barriers between various genres and types of books. It’s kind of nice that you can’t know at a glance (usually) whether a Kindle page of text comes from Proust or from Stephanie Meyer. Maybe that will make us into more sophisticated readers: ones who are able to read both literature in the way that we read commercial fiction and vice versa. 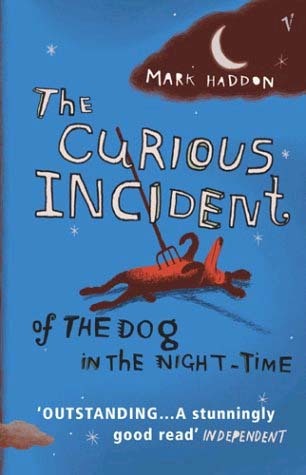 By breaking down the visual shorthands that constrain our range of interpretations and reading styles, we might learn to, say, read the Twilight series as a haunting tale of teenage depression, or read The Curious Case Of The Dog In The Night-Time as a sort of boy’s adventure (something akin to the Hardy Boys).